When you think about solar and solar panels, the first thing that most likely pops into your head is sustainability. While solar panels and solar energy are sustainable, the manufacturing of solar panels does have a footprint. Solar panels require various minerals and processes that use natural resources and have an impact on the environment. Silicon Valley Toxics Coalition created the solar scorecard to grade solar panel manufacturers sustainable practices to help reduce the impact of manufacturing solar panels. For the second year in a row, SunPower was rated the most sustainable solar panel manufacturer. Let’s take a look at what makes SunPower the most sustainable solar manufacturer. What is the Solar Scorecard? Each category has a specified top rating of either 10 or 15 with a total possible score of 100. 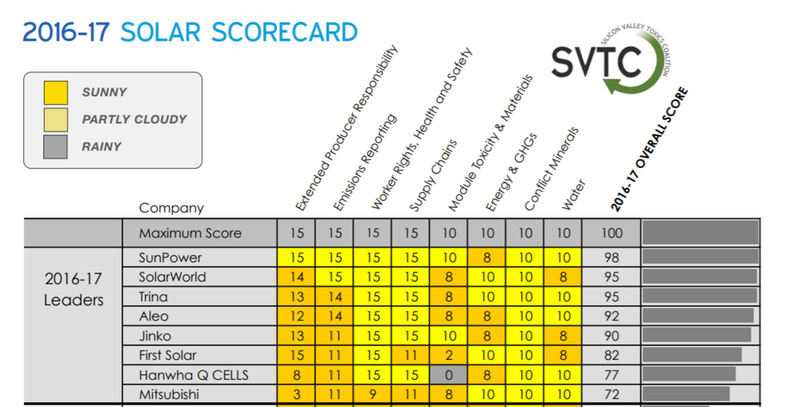 SunPower scored a 98/100 on the scorecard. What Makes SunPower More Sustainable? SunPower institutes a variety of practices in research, development, and manufacturing to make sure that all resources used are used minimally and thoughtfully. At SunPower’s Silicon Valley Research Facility, they deployed techniques that help cut down on water usage and the electricity needed to produce cells and panels. SunPower also has a solar recycling program in place to help achieve the vision of producing landfill free products. SunPower has also joined forces with other solar manufacturers and SEIA to launch a first of its kind U.S. Solar Panel Recycling Program. All these efforts and more, both by SunPower and other leading sustainable companies, aim to create quality products and goods that consumers can feel good about supporting. While we are proud of this ranking and achievement, we view the Solar Scorecard not as an award but rather as a benchmarking tool. It helps us understand what we are doing right and what we need to improve. It also encourages us to have an ongoing dialogue with SVTC and other stakeholders to help guide SunPower’s sustainability strategy. SunPower also believes in building new highly efficient manufacturing plants. SunPower’s Mexicali, Mexico plant became their first triple certified plant. SunPower is the world’s first and only solar company to earn the prestigious Cradle to Cradle Certified Silver designation. Products that receive recognition from the Cradle to Cradle Products Innovation Institute are ranked against strict standards in material health, material reuse, renewable energy use, water stewardship, and social fairness. Solar panels and solar energy are a great source of clean energy, but though most people think of sustainability when thinking about solar, some manufacturers do a better job of producing sustainable solar panels. Silicon Valley Toxics Coalition’s scorecard helps consumers and solar manufacturers learn about their manufacturing practices and determine how sustainable a company is. SunPower was ranked the #1 solar panel manufacturer with a score of 98 out of 100 thanks to their sustainable practices and commitment to constant improvement.